"Being pro-life is not just about protecting the unborn's right to life, but also ensuring that those children will grow up in a safe and nuturing environment, have good schools, and are afforded the best opportunities available to succeed in life. Our kids are our most valuable yet vulnerable treasure, and during the time I've been governor, Arkansas has taken enormous steps to recognize and protect children, those born and unborn." Mike Huckabee will be the first to tell you he entered into politics in order to make a difference. He will be just as quick to let you know that definitely includes protecting the rights of the unborn. As Governor, Mike worked diligently with the Arkansas General Assembly, passing key pieces of legislation written to ensure every life in Arkansas is valued and protected. 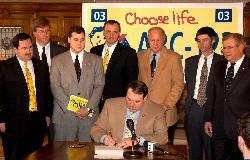 With the Fetal Protection Act in 1999, Mike Huckabee changed the debate in Arkansas on abortion. This legislation revised Arkansas’ criminal code, allowing an individual convicted of attacking a pregnant woman and causing the death of her unborn child to be charged with murder. This language codifies into Arkansas law recognition of an unborn child as a human being, recognition not available prior to the passage of this act. The bill clearly states that the taking of this life could be punishable by imposition of the death penalty. After hearing numerous horrific stories of newborn abandonment, in 2001 Mike Huckabee pushed for the passage of his Safe Haven Act. With enactment of this law, a mother now has the right to drop off her newborn at any medical facility in Arkansas without fear of legal repercussion. When signing this bill into law, Mike said, "It is my hope that this act will end the senseless abandonment of defenseless children, save lives, and also provide the opportunity for adoption and a safe environment for these children to live." Education is the key factor to making a competent decision and naturally it is no is no different when considering medical procedures. Clearly, if you were to undergo an operation or medical procedure, you would discuss it with your doctor, seeking as much information as possible. Historically though, in the case of abortion, there was little to no education or discussion. Mike Huckabee recognized this shortfall and pushed through the Woman’s Right to Know Act of 2001 creating the option of this much needed information. Today, if a woman so chooses, she can receive any and all information available about an abortion before the procedure. Some may contend this is merely an effort to reduce the number of abortions. Factually, this bill is predominately an effort to better educate a woman to all the repercussions of this procedure, ensuring they are fully informed before making such a life altering decision. For Mike Huckabee, being pro-life is not just about protecting the unborn’s right to life, but also ensuring children grow up in a safe and nurturing environment, have good schools, and are afforded the best opportunities to become successful. A recognized factor in the equation seeking this success is helping make sure they have a mother and a father raising them. Under Mike Huckabee's leadership, Arkansas has taken numerous steps promoting programs to ensure the success of marriages. Sadly, Arkansas historically holds one of the highest divorce rates in the country. Mike found this unacceptable and upon the convening of the Governor’s Conference of the Family declared a state of marital emergency in Arkansas. Clearly, Mike Huckabee does not believe government should be in the business of interfering in the personal lives of our citizens. But just as clearly, he does believe government is here to protect children and manage the state in a fiscally responsible way. The cost of divorce, while incalculable on a personal level, is staggering for the Arkansas. According to the National Fatherhood Initiative, 75 percent of children living in single-parent families experience poverty before the age of 11. Therefore, after looking at these statistics and meeting with people across the state, Mike Huckabee proposed and eventually signed into law the Covenant Marriage Act of 2001. Arkansas joined two other states in providing couples, married or newlyweds, the option to enter into a commitment less easy to dissolve than the common marriage. With their agreement to enter into a covenant marriage, couples accept premarital counseling and acquiesce to more limited grounds for divorce except in the instance of issues related to spousal or child safety. Across Arkansas, numerous pastors embraced the idea, refusing to perform wedding ceremonies for couples unwilling to make the effort of receiving premarital counseling. Mike Huckabee believes government should provide incentives promoting marriage and providing stable lives for our citizens, especially our children. One of the incentives he signed into law was elimination of the marriage penalty. To Mike, it was illogical for government to penalize a married couple for filing joint income tax returns. Mike worked tirelessly over the last ensure unborn children are recognized as human beings with a right to life, to help ensure they grow up in a safe and nurturing environment. Mike Huckabee focused on encouraging life, emphasizing every life as one possessing meaning and value. Fortunately for Arkansans, Mike took his efforts even farther, promoting healthy marriages, healthy environments, and a solid education system. Our Creator charged us with caring and watching over his creation. Mike Huckabee believes it is our sacred duty to provide for the welfare and care of future generations.